The Camp Alexander MTB Race takes place on the Camp Alexander Trails near Emporia, Kansas. The course will consist of approximately 4 miles of tight and twisty single track (about 75% single and 25% double) and a couple miles of gravel. The event is hosted by the Health, Physical Education, and Recreation (HPER) Club at Emporia State University, and consists of a 5K walk or run and 10K and 20K bike races. The 10K beginner race begins at 9am, and the 20K advanced race is at 9:30am. All who pre-register will get a T-shirt. To pre-register, contact Lauren Loucks at lloucks@emporia.edu. 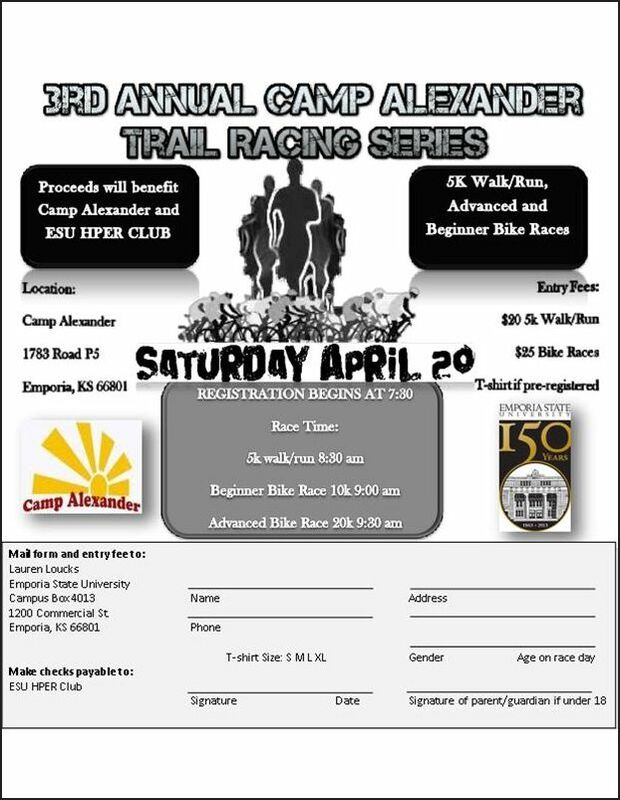 04-20-2013 Camp Alexander MTB Race - A mountain bike race and trail run that takes place on the Camp Alexander trails near Emporia, Kansas.